info@yourchiropractorsblend.com, calling us at 1-800-647-9355 or 1-714-996-2227. If you struggle with sleepless nights, whether from chronic stress, anxiety, tension, sore muscles, or insomnia, herbal supplementation does not have the addictive effects of many prescription muscle relaxants and sleep aids. Chiropractor's Blend Muscle Ezze PM EX2 Night Time™ offers the unique herbal blend as our Original Natural Muscle Ezze Advanced V40™ day and night formula but, with added sleep benefits of natural herbs, Passion Flower, Lemon Balm Leaf, and Hops Cone Extracts, all to help promote a more calming, anti-anxiety effect at bed time. We have also added 3 mg of Melatonin, a hormone naturally produced in the brain that helps regulate sleep patterns and the body’s circadian rhythm. 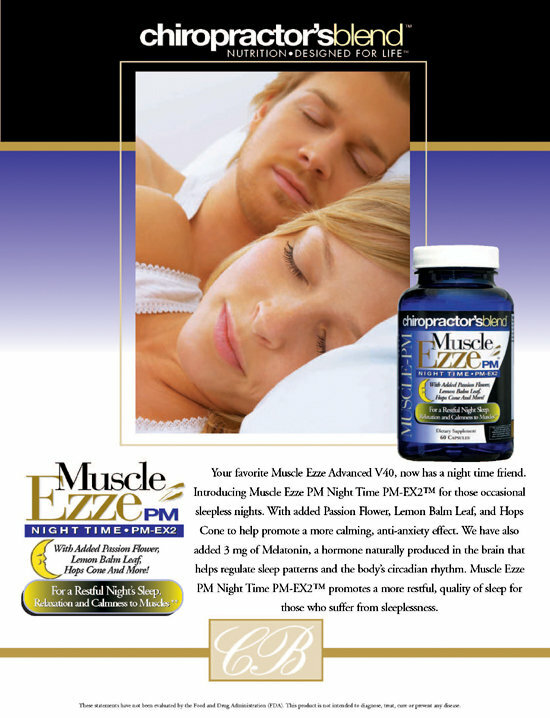 Muscle Ezze PM-EX2 Night Time™ was also designed for added support, to regulate and calm the central nervous system, support muscle relaxation and promote a more restful quality of sleep for those who suffer from sleeplessness. Without morning grogginess Muscle Ezze PM-EX2 Night Time™ helps promote an overall sense of well-being and gives us the opportunity for a fresh start to our day! Passion flower has a tranquilizing effect, including mild sedative and anti-anxiety effects. In studies conducted since the 1930's, its mode of action has been found to be different than that of most sedative drugs (sleeping pills), thus making it a non-addictive herb to promote relaxation. The sedative effect of Passion flower has made it popular for treating a variety of ailments, including nervousness and insomnia. Research had indicated that passion flower has a complex activity on the central nervous system (CNS), which is responsible for its overall tranquilizing effects. Also, it apparently has an antispasmodic effect on smooth muscles within the body, including the digestive system, promoting digestion. Safety: There are no reported side effects for passion flower. Lemon balm ( Melissa officinalis ), a member of the mint family, is considered a "calming" herb. It was used in the Middle Ages to reduce stress and anxiety, promote sleep, improve appetite, and ease pain and discomfort associated with digestion (including flatulence and bloating as well as colic). Today, lemon balm is often combined with other calming, soothing herbs, such as valerian, chamomile, and hops to enhance the overall relaxing effect. Several studies have found that lemon balm combined with other calming herbs (such as valerian, hops, chamomile) helps reduce anxiety and promote sleep. Hops Cone Extract; Hops are all natural and best known as a mild sedative and sleep aid. Hops extracts taken orally have been shown to promote restful sleep. Hops while 100% natural are quite complex and contain many different compounds. Scientists have identified and successfully separated out several components that are natural sedatives without side effects, grogginess, or dependency. Melatonin is a natural molecule made by the pineal gland, which is located in the back of the brain. We produce this natural substance abundantly during our early years, but levels decline steadily as we age. The use of Melatonin is based on years of solid research that supports its important role in the body. Studies show that Melatonin combats insomnia by regulating the circadian rhythm (sleep/wake cycle). Additionally, Melatonin has been suggested for insomnia. So what’s keeping you from a good night’s sleep? Warning: Taking this product may impair one’s ability to drive and/or operate heavy equipment. Alcohol may intensify the effect. Pregnant or lactating women, diabetics, hypoglycemics and people with known medical conditions and/or taking drugs should consult with a licensed physician and/or pharmacist prior to taking dietary supplements. For adult use only, keep out of the reach of children. Suggested Usage: Due to the potency of this product, we recommend taking Muscle Eeze PM in a safe and controlled environment. Excessive consumption may impair one’s ability to drive and/or operate heavy equipment. To support restful sleep, (First night start with 2 capsules), take up to 4 capsules on an empty stomach with 8 oz of water 45-75 minutes prior to bed or as directed by your qualified health care provider. Here's what our customers are saying about our products and service! I LOVE Muscle Ezze PM! WOW. I bought this product for my lower back pain and it did take 6 days to work BUT not only did it relieve my lower back pain it relieved my neck pain (degenerative disks) AND my TMJ. I can finally get a full nights sleep and wake up feeling human. My best friend recommended this to me after she was in a car wreck and got whiplash. The only drawback is the cost. (about $25 every 15 days of dosage). So sad that this kind of pain relief cannot and never will be covered by insurance. *Thanks Big Pharma and lobbyists for Big Pharma, Thanks Monsanto, Searle, FDA (btw, all run by the same execs! )* Love Muscle Ezze PM! It has no addictive drugs, just herbs. I have lower back pain problems which are compounded by playing a lot of golf. Tense muscles caused by the pain only compound the problem more. I don't take this every night, but the night before a tournament or important match, I take it and it helps me get the rest and sleep I need. I have suffered fewer leg and feet cramps... how do I know this, they don't cause me to awaken! Sleeping better, deeper sleet so it seems. Having had arthritis for over 40 years, my sleep was disturbed frequenlt by pain and discomfort, This amazing and healthy aid, has helped me relax and get a good noght's sleep-I would and have recommended it to many people. Love this product! Incredible delivery time. I love this stuff! Super sonic shipping!!! I love it- very happy customer, thank you!!!! LIKE ALWAYS ..... PERFECT !!!!!!! Excellent product! Repeat Customer, will buy from here again and again! Great product! I am a regular customer already! This was my third order; need I say more? I can really tell the difference. Thanks for being so dependable!!! Real deal. Awesome!!! Great product! I will be regularly purchasing this from you from now on. Exceeded expectations...will be ordering again! Thank you! Best ingredients on the market. Warning: Pregnant or lactating women, diabetics, hypoglycemics and people with known medical conditions and/or taking drugs should consult with a licensed physician and/or pharmacist prior to taking dietary supplements. This statement has not been evaluated by the Food and Drug Administration (FDA). This product is not intended to diagnose, treat, cure or prevent any disease.